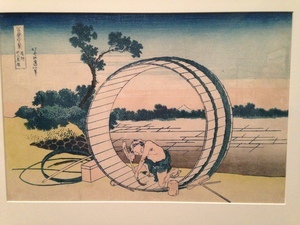 The summer of Hokusai at the Museum of Fine Arts is over. 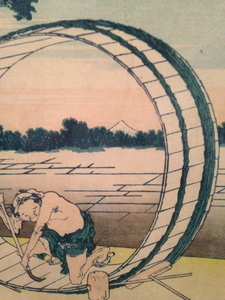 I made four brief visits, most with children; they were interested in their own ways. I was only able to stand really still in front of perhaps twenty of the pieces altogether. But I have the photographs and from those I can look back and work out something of what my eye and I were interested in. Edges. Here is the stone bridge in detail. 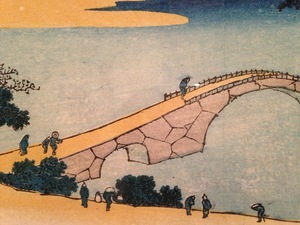 The places where people walk – the bridge, the sand in the foreground – have a sharply outlined edge. When we ourselves stand near the water, the edge of the land is very definite to us. But the land in the distance meets the water with a different, softer edge. The figures are tiny, and far below us, but we see with them because of the rendering of the edges. 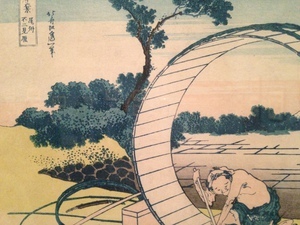 This was the bridge along which one walked from the pleasure quarter at Nakashima to the center of Chinese learning at the Confucian temple in Kumemura. That is another way of thinking of the edge between summer and fall. 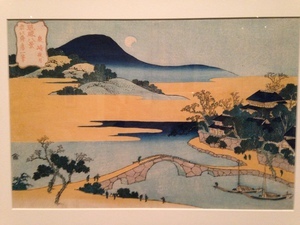 Here is “Fuji View Plain in Owari Province,” with the signal double-edge of Mount Fuji, tiny within the barrel-in-progress, but present as it is in each of the thirty-six views. And those on the right, with the textured binding and its relationship to the leafy band at the foot of the mountain. 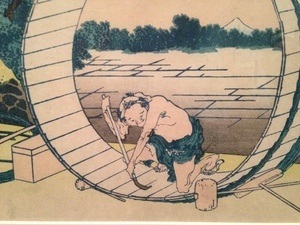 Out of these edges Hokusai and the barrel-maker achieve unification. 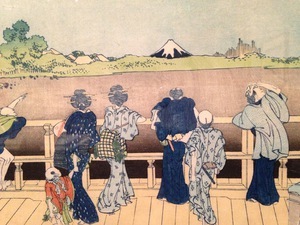 That unification seems intended to bear on how we, the viewers, are meant to unify the thirty-six views of Mount Fuji into an understanding of Mount Fuji. It was a summer of edges – of arrivals and departures, the loading and unloading of suitcases, the edges of wading pools and of wooden docks pointing into the water, and of the distant edges of ponds which we never swam quite all the way to. Rounded and mellowed by the turn of the year, it stands whole.